Greek Mythology; Hephaestus, Aphrodite, and Ares. 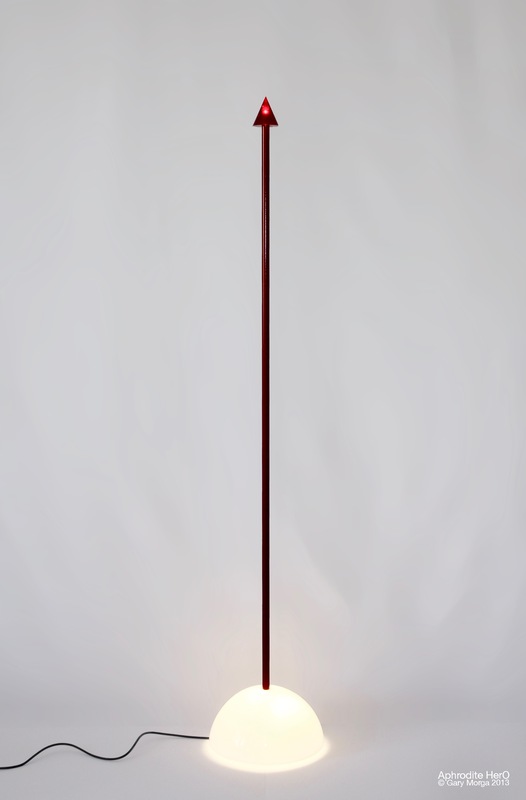 Right, the red light at the end of the pole flashes constantly while connected to the power, it signifies panic. Hephaestus has caught Ares and Aphrodite in a net. 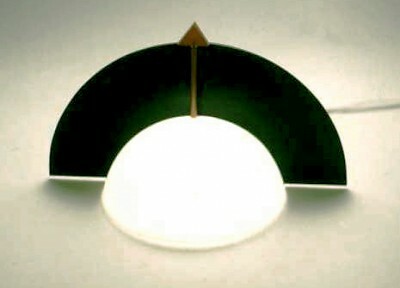 The on/off switch for the white hemispherical light is found by inserting your finger up the open end of the pole. The light can locate on the floor or it can be fixed to a wall. Center, to switch the light at the bottom on/off grab hold of the pole and push it down. The light at the top remains on constantly while connected to the mains. There’s more about this light here. 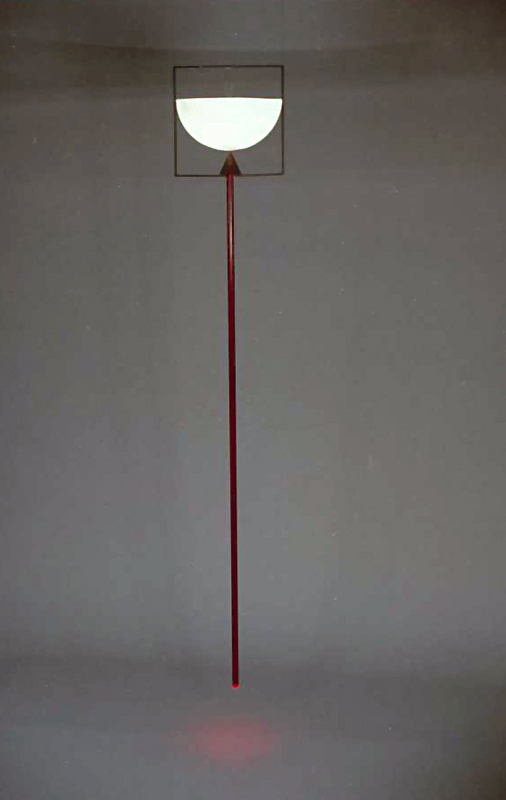 Left, a suspended lamp. 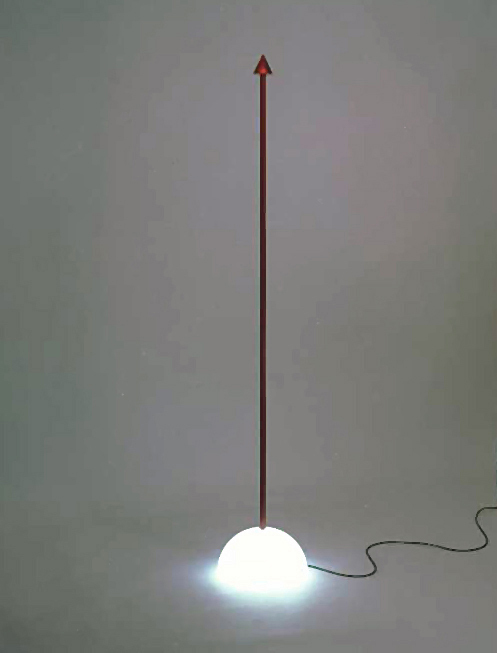 Power comes into the lamp from the two conducting cables that also suspend the light. 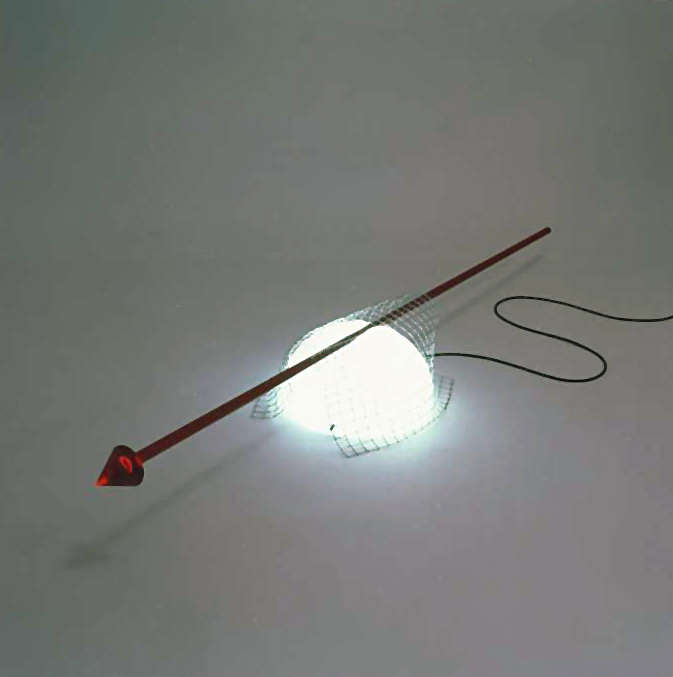 The power is conducted through the structure of the light to the lamp at the bottom that throws a red pool of light onto the floor. This lamp remains on constantly. The white light at the top in the hemisphere is switched on/off by rotating the pole. There is a square, black metal frame around the white hemisphere, Aphrodite, that signifies man-made ignorance. Aphrodite is in our catalogue under PRODUCTS in the main menu. Hephaestus and Aphrodite are married. Hephaestus is the metalworker of the Gods. He’s depicted as blackened and lame and not really one of the guys. Aphrodite is the Goddess of seduction and femininity. Ares is the dashing God of war and is very much one of the guys. Ares and Aphrodite have an affair while Hephaestus is busy elsewhere. While they are in a passionate clinch Hephaestus notices them. Hephaestus makes a net of metal in his workshop, that is under Mount Olympus, and catches Aphrodite and Ares. He holds them up high for all the Gods to see. The Gods on Olympus lavish sympathy and attention on poor Hephaestus. He enjoys the attention he receives and is held high in esteem by them, at least for a short time. Ares soon gets back to himself, the masculine, god of war, and Aphrodite gets back to being herself, a beautiful, femme fatale. And Hephaestus, blackened, lame, the lesser man, is exclude and is back in his workshop under the mountain. Life returns to normal on Mount Olympus. 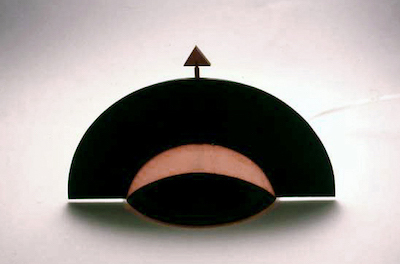 The design makes use of three elements chosen for their symbolic values. These elements are signs that represent the three characters in Greek Mythology. By changing the arrangement of the signs to one another, their position in the sequence and the meaning changes. This concept is similar to spoken language or written words written in sentences. See, Ferdinand de Saussure’s theory of language, Structural Linguistics for more on the structure of language and the three types of sign. Seperate from the three on the left. Eros & I is a bedside lamp. The switch is the arrow head. Press it down to switch the light on/off and “prick”your finger with Eros’s arrow of love.